Cravings during pregnancy may cause you to want sweets such as cake and candy. While an occasional sweet treat is not problematic, too much of a good thing can be bad. Your diet is especially important when you are pregnant and most cakes offer little in the way of nutritional value. This does not mean you have to skip a piece of the belly-shaped cake served at your baby shower, but speak with your doctor about the importance of eating desserts in moderation. Your immune system is weaker than usual when you are pregnant. A weaker immune system increases your chances of becoming ill if you eat certain foods, which could potentially harm your baby. Special occasions are just as risky as other days and should not be an excuse to eat uncooked baked goods. Cake batter with raw egg may have harmful bacteria such salmonella; resist the urge to taste cake batter or cookie dough. 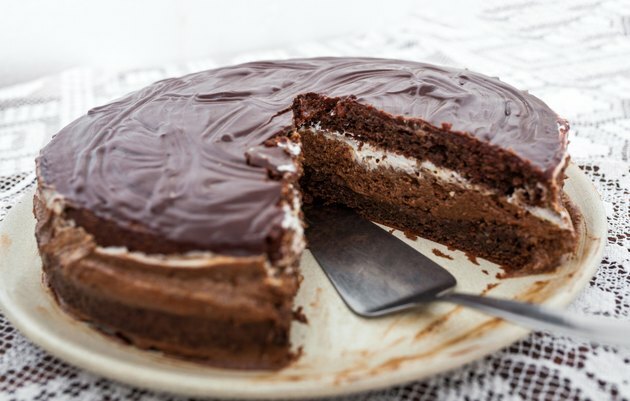 Even a homemade cake that was not cooked thoroughly could contain bacteria such as toxoplasma and listeria that are able to cross your placenta and make your baby sick, too. Snacks such as cakes, chips and sodas contribute to excessive weight gain during pregnancy and do not give you any of the nutrients your developing baby needs. Gaining around 30 pounds is normal, including 7.5 pounds for the baby, plus weight from the uterus, extra breast tissue, body fluids, blood volume, amniotic fluid and placenta. Do not completely eliminate sweets, just eat them in moderation and ensure that you still get enough nutritious foods. Also, be wary of cakes made with saccharin -- though not proven, there is some concern that it can cross the placenta and negatively affect the fetus, according to Pregnancy Weekly. Some cakes and chocolates contain alcohol such as rum, bourbon and amaretto that may not be safe for you to consume when you are pregnant. The myth that cooking burns off alcohol is not completely true. According to an article from ChefMom.com, how much alcohol burns off during baking and cooking depends on the temperature, type of alcohol and the ingredients. Even though alcohol may add flavoring to cakes, alcohol can cross the placenta and cause complications. Potential problems include birth defects, premature delivery and mental retardation. No safe amount of alcohol during pregnancy has been established. Your cake or baked goods may contain harmful supplements. According to an article published on the Psychology Today website in February 2011, a product called Lazy Cakes has 4 milligrams of the supplement melatonin in addition to valerian root. Melatonin and valerian root may help you sleep, but they may also harm your baby. Your body naturally produces melatonin to regulate your sleep-wake cycles so supplements may help people with sleeping problems. Valerian may also help you relax. However, both melatonin and valerian are possibly unsafe for pregnant women, according to MedlinePlus.